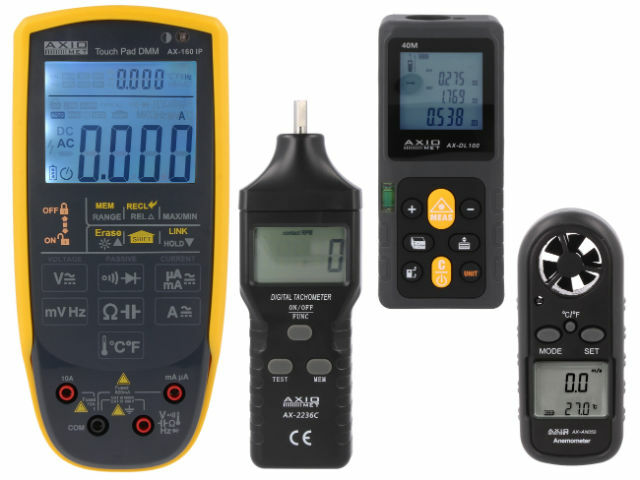 The offer of multimeters, the most popular and multifunctional measuring instruments, has been enriched by models that will meet different needs of electronic engineers. TME's offer includes e.g. a reliable analogue multimeter AX-7020, and digital multimeters: AX-102 with non-contact voltage detection (NCV) and AX-595 with a USB interface. More demanding users may be interested in the splash- and dustproof (IP65) model AX-160IP, operated via an innovative touch panel. TME's offer also includes the AX-DL100 rangefinder with measuring range of up to 100 metres, which enables precise measurements not only indoors, but also in the open space. Yet another novelty are tachometers supporting optical measurements (AX-2234C), or enabling you to choose between optical and mechanical measurements (AX-2236C). The instruments come in convenient cases. What's more, due to the fact that the AX-TACHO-TAPE reflexive tape is available in TME's offer, tachometer users don't have to save on the tape that comes with the meter. TME's offer also features the latest thermoanemometer from AXIOMET, i.e. AX-AN050. Its compact size (only 10.5cm long) and clear display make it not only functional, but also very comfortable to work with. AX-TACHO-TAPE Test acces. : reflexive tape; 10.5x190mm; 10pcs.